Our annual content marketing research literally has thousands of data points our research team digs through each year. While the quantitative data is interesting, we get most excited about pondering ways to turn the findings into actionable ideas to help you improve your content marketing. 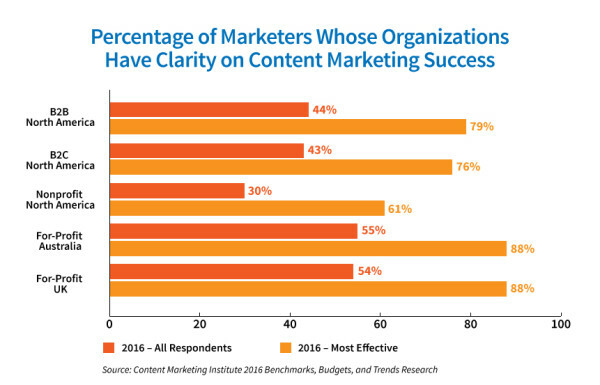 One of the key areas we focus on is effectiveness: What percentage of survey respondents say their organizations are effective at content marketing, and how has this changed since last year? 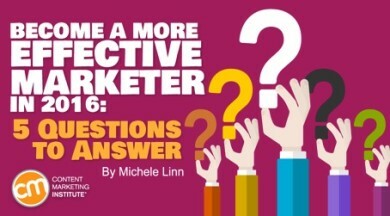 And, more importantly, what can you do to become more effective at content marketing? The chart below shows the percentage of responding marketers who rated their organizations a 4 or 5 in terms of effectiveness (on a scale of 1 to 5, with 5 being “very effective” and 1 being “not at all effective”) on our last two annual content marketing surveys. On the survey, we define effectiveness as “accomplishing your overall objectives.” We refer to those who rate their companies a 4 or 5 as “most effective” or “best-in-class” marketers. 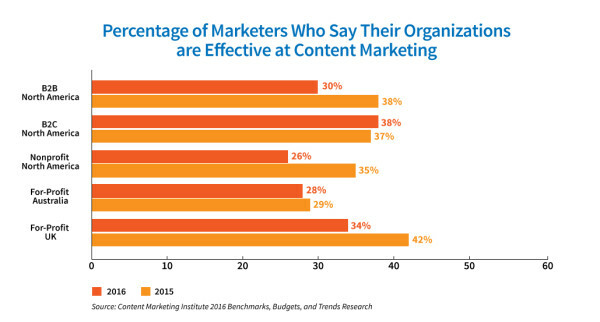 As you can see on the chart, the proportion of marketers who report that their organizations are effective at content marketing has decreased. The bigger question at hand: What can you do to be more effective? If you want to feel more effective, review these questions to see what you should focus on in 2016. Do you know what the goal of your content is? 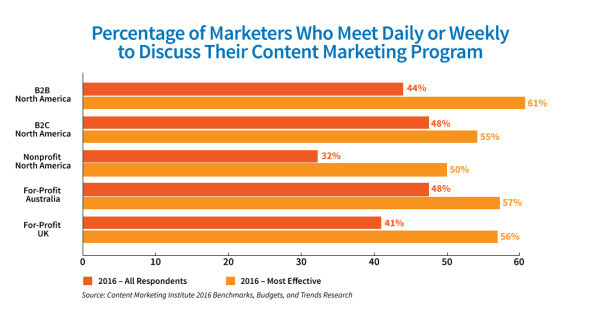 Not surprisingly, marketers who are more effective are more likely to have answered “yes” to that question. Understand what metrics support success as viewed by management. Are you focusing on the right metrics? While these are not bad goals, they are not quantifiable. And because they’re not quantifiable…how do you know if you have truly been successful? Furthermore, does effectiveness and success mean the same thing to everyone on your team? And even when goals are quantifiable, our research shows that in terms of the metrics they use, many marketers are relying on low-level indicators such as social shares and web traffic. As Joe discussed in his analysis of the Australian research, these are not bad metrics, but they aren’t necessarily moving the needle. While many metrics are important, you should focus on: building subscribers (which is different than generating leads). Your audience is more valuable when it’s filled with people who actively want your content (just as it is for traditional publishers). Are you creating content that stands out from what your competition is publishing? If you want to build an audience, your content needs to be different than what others are providing. While the research doesn’t specifically address this, one anecdotal reason we see content fail is that it lacks a point of view or sounds like what everyone else publishes. To differentiate your content, you need what Joe refers to as the content tilt. In short, it’s looking at your current positioning and tilting it so it’s different than what anyone else is offering. Asked another way: What content would your audience miss if it were gone? As I’ve said previously, this is, hands-down, my favorite concept is his new book, Content Inc. – and it’s an approach I have used many times to figure out how CMI can fill a gap with our content. You can read about all of the steps of the Content Inc. model in this free e-book, 6 Steps to Building a Content Inc. Empire. Are you giving your content enough time? Even once you have a clear vision and a differentiated editorial mission statement, you need another ingredient – experience. 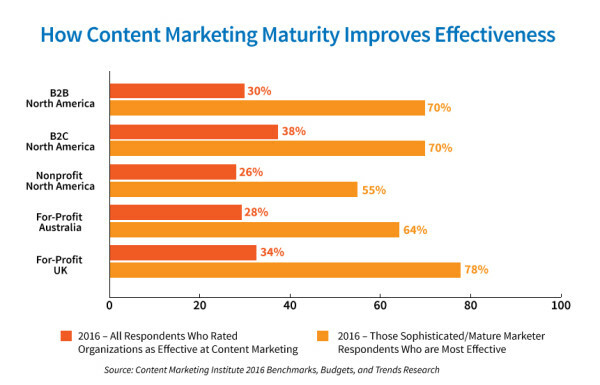 As you see from the data below, companies that are more mature in their content marketing efforts are definitely feeling more effective. Our anecdotal research backs this up as well. As the basis for Content Inc., Joe conducted dozens of interviews with people who have created successful businesses based on content. One of the threads that ran through each story is that it takes time, often between 15 and 17 months (and in many cases 18 months or more). Our advice: Be consistent and patient – and focus all of your energy into building an audience. Are you communicating with your team? Document their content marketing strategy. Having a verbal strategy is not enough. Download our 16-page guide that walks you through what questions your documented content marketing strategy should answer. Have frequent meetings – and get more value from those meetings. Here are tips on how to have meetings that are more productive and less soul-sucking. Want to dig into more of the research? Check our archives or see more insights. Want to keep updated on the latest research, trends, and more? Subscribe to our daily or weekly email.